Mouth guards, also known as sports guards or mouth protectors, are used for the prevention of oral and facial athletic injuries. They are essential for many sports that involve body contact, falling, or being struck in the head or face by equipment. We recommend custom mouth guards especially for patients that wear braces or have other fixed dental appliances. We are able to create custom-made mouth guards that are more comfortable and provide better protection than over-the-counter varieties. Night guards are often beneficial for people who “grind” or “clench” their teeth while sleeping, a habit called bruxism. According to the American Dental Association, approximately 10-15% of adults suffer from this condition. Night guards help to protect natural teeth as well as any replacement teeth and aid in preventing jaw pain and/or other affects of teeth grinding and clenching. 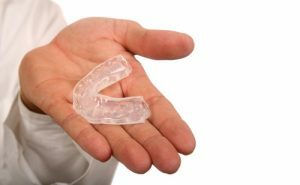 At Crystal Coast Dentistry we are able to create custom-fit night guards to help patients sleep comfortably. Obstructive sleep apnea (OSA) is a disorder that occurs in about 18 million Americans. This condition occurs when the tongue and soft tissues collapse back into the throat during sleep causing breathing to stop for short episodes. It is important for patients to be treated for this condition because it can cause daytime sleepiness, increased risk for high blood pressure and heart problems, stroke, and even death. Custom-fit oral appliances are an effective treatment option for patients with mild to moderate OSA. We are able to make comfortable oral appliances that will help patients breathe easier and sleep more soundly.